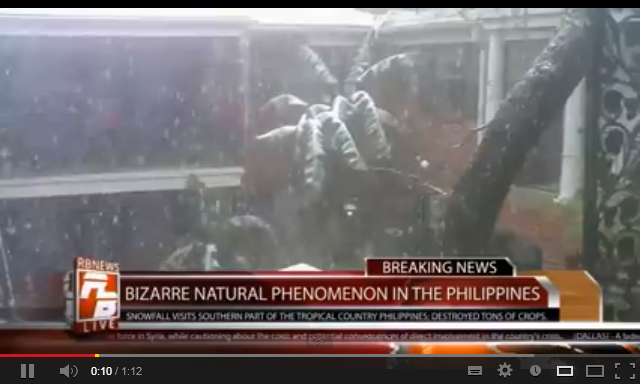 Hot News: Philippines first snowfall on July 24, 2013 - Real or Hoax news? Philippines breaking news snowfall on July 24, 2013 in southern part of country. This news goes viral online and in social networking websites. Is there snowfall in Philippines or just an Hoax? Mayroong video ng RodsburghNewsLive sa Youtube na nagsasabing First Snowfall here in the Philippines and it was happen in Southern part of the country. It was not confirmed yet but many believes that this is only a fraud and false news. "Meron nga bang Snow sa Pilipinas? Kung meron bakit hindi nabalita sa mga popular tv news channels at bakit foreigner pa ang nagupload ng video? said commentors." I hope its true.Its hot but the air is cool.maybe its true. Hoax!hahaha...! walang balitang ganyan dito sa pinas!